We're holding our Chipotle fundraiser THIS SUNDAY from 5-9 PM, please come out to support the team if you can! You just need to show the cashier the flier or mention that you'd like to support CHS Science Olympiad! Thanks to everyone who came to Back to School Night and visited our board! 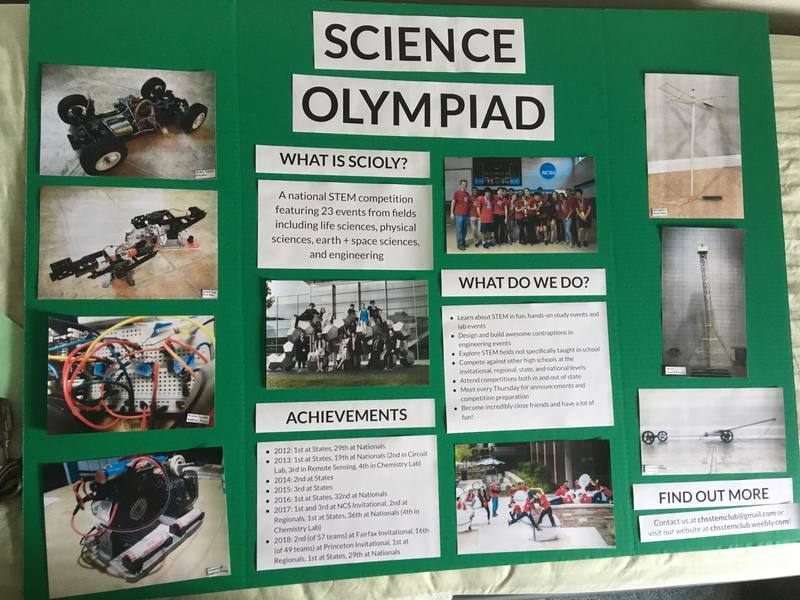 We met a lot of students and parents interested in STEM, and we're very excited to see so much interest in science olympiad! If you couldn't come but are interested in the club, email us at chsstemclub@gmail.com so we can add you to the email list! Up next in our schedule is our interest meetings, which will be held on Thursday, 9/13 and Friday, 9/14. We are presenting the same information on two days for anyone who might not be able to make one day or the other. We'll be talking a little bit more in depth about the club, explaining the tryouts process, and giving a rundown of the 23 events this year. Hope you can join us! If you can't make either meeting, let us know that you're still interested and just can't attend. We will be emailing out the powerpoint presentation and tryouts information afterwards. See you on Thursday or Friday! From May 17th to 20th, we represented Maryland at the national tournament at Colorado State University! Facing 60 teams from around the U.S. plus an honorary team from Japan, our team competed in 24 events on Saturday. Overall, CHS placed 29th, with a 9th place in Code Busters, 12th in Chemistry Lab, 14th in Fermi Questions, 14th in Hovercraft, 16th in Astronomy, and 18th in Helicopters. We are very proud of our placements and will continue to work hard to improve! ​The team had a great time in Fort Collins and hopes to make the national tournament for the fourth year in a row next year! This is a new page where we'll occasionally post about what the club is up to!